India and Pakistan have launched a new cross-border bus service which directly links divided Punjab for the first time since partition in 1947. Passengers travelling on the inaugural Lahore-Amritsar bus received a rousing welcome as they crossed into India at the Wagah border post. 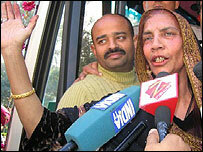 Among the 26 passengers were 15 Pakistani officials and the famous folk singer, Reshma. This is the rivals' third such link and is seen as a symbol of peace. 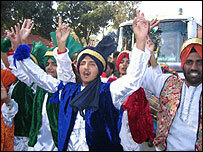 School children showered rose petals on the bus as it crossed the land border into India. Earlier, the bus had left the Pakistani city of Lahore amid the beating of drums. India and Pakistan restarted a Delhi to Lahore service in 2003 and a route across the disputed and divided region of Kashmir began in April last year. "It will promote tourism, understanding and stability between the two countries," Aslam Iqbal, a minister in the provincial Punjab government, told the Associated Press. Reshma told the BBC her journey had been pleasant and comfortable. "I was originally booked on a flight to India but cancelled my booking and bought a bus ticket instead," she said. "Cultural ties are going to play a major role in improving ties." She plans to give a number of performances during her stay in India. The new service comes as a boost to India's Sikh population who will be able to use it to visit the holy site of Nankana Sahib in Pakistan, where the founder of their faith, Guru Nanak, was born. A separate service connecting Amritsar to Nankana Sahib is also due to begin later this year. Next month, India and Pakistan will also relaunch a rail service between the Indian state of Rajasthan and Pakistan's Sindh province. The service was stopped 40 years ago when the two countries went to war. The bus diplomacy is one of the more tangible elements of the two-year peace process between the nuclear-capable rivals, who nearly went to war over Kashmir in 2002. India and Pakistan both claim Kashmir in its entirety and have fought two of their three wars since independence in 1947 over the region. Despite the increasing transport links, the two nations have still made little progress on a political solution for Kashmir. The cross-Kashmir bus service was suspended indefinitely in the wake of the 8 October earthquake that killed about 75,000 people.